The Perth Symphony FRIENDS membership program is a great way to connect with music and Perth Symphony, and perhaps even make dreams come true..! Malcolm Pratt has been a long time supporter of Perth Symphony, and chairman of the Perth Symphony Friends committee. If you’ve seen us play before, you most likely would have seen Chief Conductor – Jessica Gethin conducting from a beautiful Jarrah podium, which was kindly donated by Malcolm. We were able to give him some VIP tickets to see Perth Symphony play down at the Leeuwin Concert at the beginning of March and this is his incredible story..
“My late wife (Joan) passed away five years ago about a month before my birthday. After the funeral I began the task of going through her things to send those suitable to The Good Sammy’s when I discovered that she had already purchased my present. We used to buy each other CD’s as by our age we had virtually everything we really wanted. I had seen this particular new release advertised on the TV and happened to mention that I wouldn’t mind buying it as it was my favourite male singer singing some of my favourite songs. 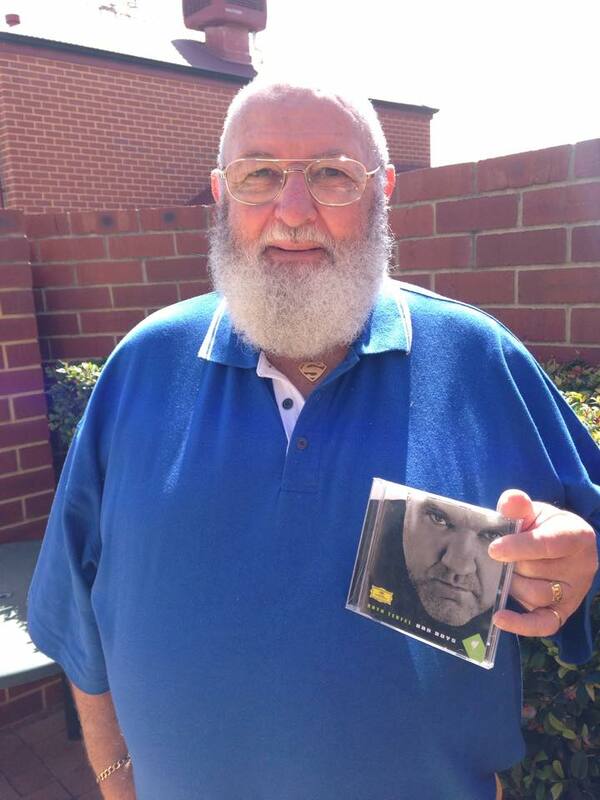 The CD was Bryn Terfel’s “Bad Boys”. In conversation, I mentioned to Bourby that it was unlikely that I would go to the Leeuwin Concert and told her the story asking if she could possibly get Bryn to sign the CD for me as it has special significance to me. Not only did PSO arrange for me to attend the concert, they arranged for me to meet Bryn after the performance in his dressing room. He was gracious and generous with his time, and after I told him the story of how the last thing my wife gave me was a Bryn Terfel CD, he generously inscribed the CD for me. It now has even greater importance to me and is among my most treasured possessions. The concert itself was terrific, I loved the variety of songs Bryn chose which displayed his mastery of opera and musical theatre, If I Were A Rich Man from Fiddler on the Roof is a particular favourite of mine and i smiled at hearing a Jewish milkman with a broad Welsh accent!! Rachelle Durkin was not overshadowed at all and displayed a beautiful sense of comic timing which nearly stole the show and I thought the PSO’s solo performance of the piece by Ian Grandage utterly spellbinding and perfect for the setting the lighting effects were simply brilliant.